The "Girls Take Wall Street" event will focus on actionable information, wealth exposure and resources needed to maximize revenue from a global perspective in New York, August 3-5, 2017. Dr. Jewel Tankard Launches "Girls Take Wall Street"
Featured in Huffington Post, Black Enterprise, New York Post and more - Dr. Jewel Tankard is bringing her wealth of financial knowledge and literacy in the form of her much anticipated Millionairess Club Experiential Events to cities across the nation. When it comes to tracking dollars, few people can make sense of the restless financial market, let alone turn a profit. But nationally recognized financial expert and television personality, Dr. Jewel Tankard has mastered the art of generating revenue no matter the current economy or surrounding hardships. Jewel Tankard's Millionairess Club partners with Dr. Chyna Bethley (renowned motivational speaker) and Marye Dean Esq., one of the most prominent African American attorneys on Wall Street, for "Girls Take Wall Street". 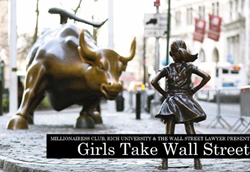 The "Girls Take Wall Street" Interactive Tour & Educational Experience will take place on Wall Street on August 3-5, 2017. For more information visit http://www.JewelTankard.com/GirlsTakeWallStreet. "We created the 'Girls Take Wall Street' experience to unleash women's financial power and get them invested in their ultimate goals," states Dr. Jewel Tankard. The inaugural experience will take an in-depth look at the history of business and money, feature workshops and seminars on how currencies are exchanged with an insider look at Fortune 500 technology giants such as Apple, expert insight on global trade, private dinner with financial experts and so much more. 86% of Investment Advisors are men, with an average age of 50+, the "Girls Take Wall Street" tour and educational experience will open doors for women looking to be in an environment of financial experts with a "for her, by her" outlook on financial growth and wealth accumulation. Featured in Huffington Post, Black Enterprise, New York Post, ABC and more - Dr. Jewel Tankard is bringing her wealth of financial knowledge and literacy in the form of her much anticipated Millionairess Club Experiential Events to cities all across the nation throughout 2017. The "Girls Take Wall Street" event will focus on actionable information, wealth exposure and resources needed to maximize revenue from a global perspective in New York, August 3-5, 2017. For more information and to view the tour list visit http://www.JewelTankard.com/GirlsTakeWallStreet. To join the conversation follow @JewelTankard on Instagram and Twitter, hashtag #GirlsTakeWallStreet.